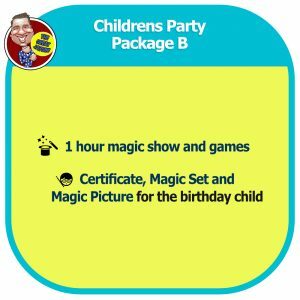 To make things as easy as possible for busy parents I’ve combined all my favourite party services into easy to understand childrens party packages. For a great children’s party please ensure there are no “noise toys” around or loose balloons on the floor! My recommended timeslots for a children’s party are 11am to 1pm or 3pm to 5pm. 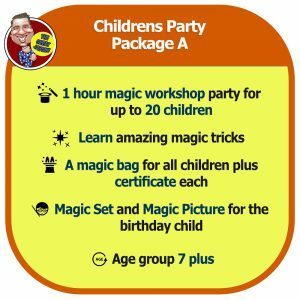 However I can also run them from 10am to Noon or 4pm to 6pm and all of the childrens party packages below are suitable for children between the ages of 4 and 12. The prices below are for parties that are held on weekends. 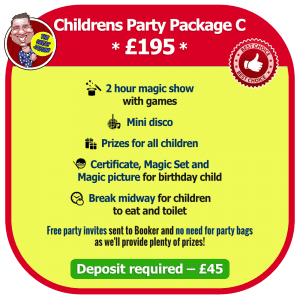 If you’d like a party mid week (Monday – Thursday) an after school 40 minute mini magic show is just £95!! Please note that all deposits are non refundable 24 hours after booking confirmation. Don’t just take my word on how good my kid’s parties are! Pop on over to my Testimonials page to read some of the best or go to Netmums for my latest reviews.